Black Friday is the day after Thanksgiving and is the beginning of the traditional Christmas shopping season in the United States. In 2007 it will be November 23rd. 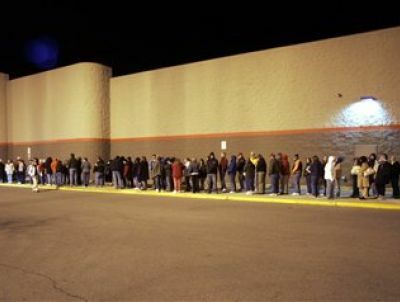 The Day after Thanksgiving, referred to as Black Friday, has become known as the busiest shopping day of the year. It is the day of year that retailers celebrate, because it is the day that the business starts to show profit for the year, with their financial red ink turning to black ink. Shoppers find Black Friday an exciting day to go Christmas shopping, because the retailers offer so many special bargains. The reason why Black Friday is so important is that shopping centers, malls, shops, open early in the morning (5 am) and offer some incredible discounts on a limited amount of goods. If you are adventurous enough to get up at 4 am and be in front of a shopping center at 5, you'll find a huge line of people, someone maybe sleeping there from the night before, waiting to get their plasma TV for half the price or they new laptop for a few hundred bucks. Here are some opening hours for 2007 Black Friday! Toys "R" Us will be opening all its stores at 5 a.m. The Christmas shopping season for online stores traditionally starts on the following Monday, Cyber Monday. That is, in 2007, November 26th. FREE Shipping on ALL Orders! Thanksgiving Day and Black Friday Only. Special Black Friday Event from Apple! In a few days, the banner on the left will offer the Black Friday special deal! Keep an eye on it! I can only tell you that there will be free shipping for sure! And your Ipod will be personalized with free laser engraving!